This week’s ramblings might seem at first disparate and irrelevant, but I assure you that this is only slightly the case… this blog, as you might have gathered, is often about links between things; not so much isolated interesting facts and snippets, but the tangleweb that connects them and us. If you wanted interesting facts, open an encyclopaedia, but it’s the connexions between things, the invisible covalent bonds of distraction that I find more stimulating. This week I have been dipping into the BBC’s archive of Rev, a TV sitcom about a Church of England priest, played by Tom Hollander, and his inner city London church. The dialogue is excellent, and the characters feature an all too familiar line up of worthies, wastrels, and worshipers. The priest and his long suffering wife negotiate the machinations of the Archdeacon, mixed emotions of the lay reader, monetary meltdown of the parish, and even the manipulation of the local teacher’s breasts by the priest. There is even a cameo by Liam Neeson as God. It’s a gritty, humorous, and real portrayal of a “socially disunited” parish, and well worth a watch. The church in question is know in the comedy as St Saviour in the Marshes, and is supposed to be in Hackney, East London. 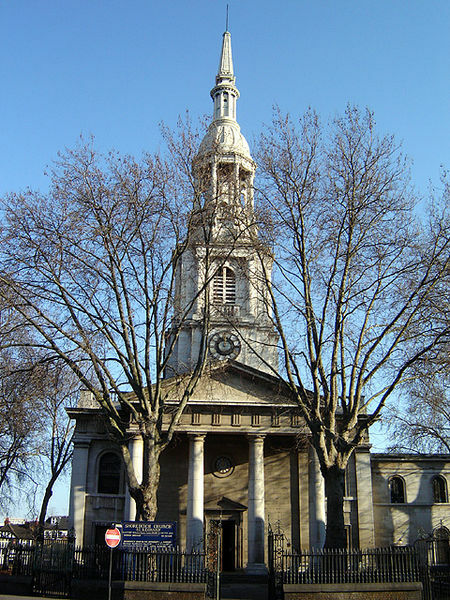 It is however actually filmed in St Leonard’s Parish Church in Shoreditch, located at the intersection of Shoreditch High Street and Hackney Road. The church was immortalised in the ancient nursery rhyme ‘Oranges and Lemons’ by the line, “When I grow rich, say the bells of Shoreditch“. Most of the church dates from 1740, but the original sections could date from Saxon times. St Leonard’s has strong links with the theater, indeed it is the resting place for many a Tudor playwright and board creeper. Many believe Shakespeare may have worshipped there, and even that it might have inspired scenes in Romeo and Juliet. That is if you believe a word that The Gurinad tells you. Some have speculated that large portions of the medieval church demolished in the 1720’s would have been familiar to Shakespeare and many of his contemporaries. The chances are that the ruins survive intact beneath the present church and surrounding land. However, due to cost and the technical difficulties of investigating beneath and around a listed building used for worship, no work has been carried out. But recently Professor Maurizio Seracini has proposed using non-invasive techniques to investigate the church and the surrounding area. I first came across Seracini when I was working for a philantropist some years ago, and Seracini was conducting 3D analysis research into the lost Leonardo da Vinci mural The Battle of Anghiari, at the Palazzo Vecchio in Florence. It is hoped that this tine he may unearth finds similar to those from a 2012 nearby dig that found remains of The Curtain Theater, where Romeo and Juliet and Henry V were first performed. “Result of event eight: one mile. 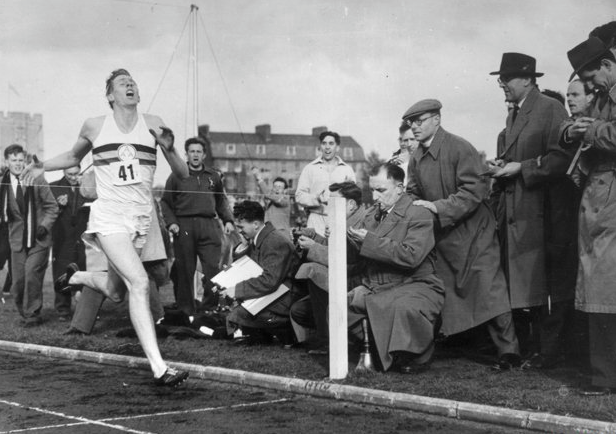 First, RG Bannister of Exeter and Merton colleges, in a time which, subject to ratification, is a new track record, British record, European record, Commonwealth record and world record – Three minutes and …” the rest was drowned out by the cheering. However the BBC has today been running a story claiming that Sir Roger might not have been the first man to run the mile in less than four minutes. Apparantly, as long ago as 1770 a certain James Parrott was wagered 15 Guineas that he could not run a mile in under four and a half minutes. The BBC paints wonderful picture of the race, describing how “with money on the line, it’s likely that umpires on both sides carefully checked the watches, locked them in a box to prevent tampering, and placed them in a horse-drawn carriage that would make sure they reached the finish line ahead of the runner.“ And that finishing line, was none other than the gates of St Leonard’s Parish Church in Shoreditch. It’s the first known report of a four-minute mile. I wonder if he saw Liam Neeson on the way?